Working at the interface between catalytic reactor engineering, applied physics and material nano-engineering, Rebrov’s research group studies hydrodynamics, mass- and heat- transfer in novel chemical reactors with a strong focus on the application of non-conventional energy sources to activate catalysts and to intensify reaction and transport processes. Examples of such non-conventional energy sources are microwave (MW) and radiofrequency (RF) fields. Current research can be grouped under development of composite magnetic materials for microwave and RF heating, study of organic synthesis in flow reactors and study of capillary hydrodynamics of multiphase flows in microreactors. Sustainable synthesis and green chemistry: synthesis of chemicals or materials by renewable resources with low carbon emission. Typical methods are electrochemical synthesis and photosynthesis. Battery and fuel cells: metal air batteries, solid state batteries, redox flow batteries, solid oxide fuel cells, molten carbonate fuel cells and proton-exchange membrane fuel cells etc. Gas separation: O2, H2 and CO2 separation. Waste water treatment: using electrochemical methods for waste water treatment. The research group is focused on development of new catalysts and processes for the sustainable production of fuels and chemicals. Our objective is to develop a complete understanding of catalytic reactions at catalytic surfaces through experimental studies. We employ advanced catalyst characterization techniques; in-situ or operando spectroscopy. The molecular-level understanding of catalytic processes guides the development of new catalytic materials and chemical processes. We are particularly interested on utilisation of renewable biomass feedstocks into monomers for bio-plastics and bio-fuels for renewable energy generation. 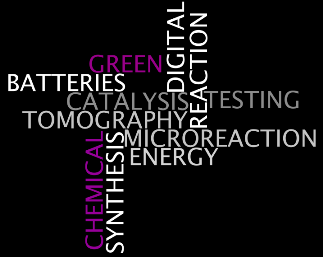 Centre of activity is heterogeneous catalysis with major expertise in the industrially relevant area to development of process elements for the activation of short chain hydrocarbons. A holistic development approach is followed whenever possible, which joins the elements of (1) analysis of elementary reaction paths, (2) (micro-)kinetic consideration of the catalytic reaction, (3) selection or development of suitable reactor systems and (4) development of superior catalysts. Detailed insight into catalytic reaction steps and related rates allow development towards a global performance optimum hardly reachable by separate tuning of individual aspects. 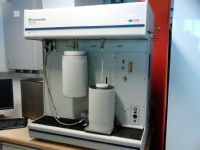 The laboratory is in the possession of advanced catalysis preparation facilities, automated catalyst testing equipment operating up to 50bars and the Temporal-Analysis-of-Products (TAP) techniques providing unique mechanistic and kinetic insight into catalytic reaction networks. The group's work is largely experimental and focusses on electronic materials for energy applications. A major current area is silicon materials for photovoltaics, where we lead a UK-wide EPSRC SuperSolar consortium to improve silicon substrates to enable the production of cheaper solar cells. Our academic expertise lies in the materials science of defects in crystalline materials. Specific topics of interest include impurity transport, impurity solubility, the interaction between point-like and extended crystal defects, and the electronic properties of defects in semiconductors. We also have general interests in the manufacturing and processing of electronic materials, and materials characterisation by electron microscope-based techniques. We have experimental facilities for measurement of minority carrier lifetime in silicon by quasi-steady-state photoconductance (QSS-PC), quasi-steady-state photoluminescence (QSS-PL) and photoluminescence imaging. A set-up for deep-level transient spectroscopy (DLTS) is on order. The DMTL has a highly diverse range of research interests that encompass cutting-edge digital and materials technologies and especially in methodologies that bridge the gap between the two areas. 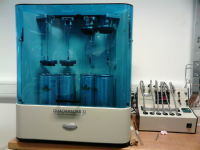 Members of the laboratory have expertise in research areas spanning materials science and chemistry through to electronics and computer aided design. The DMTL has a particular interest in the area of Additive Manufacturing/3D printing technology and its use in the production of functional, high-tech components and devices for applications ranging from aerospace, biomimetics, biomedical devices and microfluidics through to printed electronics, robotics and sensors and actuators using novel materials such as functional nanocomposites. The laboratory has a range of advanced additive manufacturing systems as well as a suite of characterization facilities including surface profiling and microfocus X-ray computed tomography. 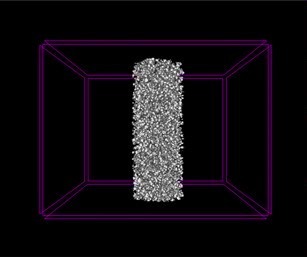 3D X-ray Computed Tomography (CT) scan of metal particle distribution in a composite material. Please click on images to go through to booking page.